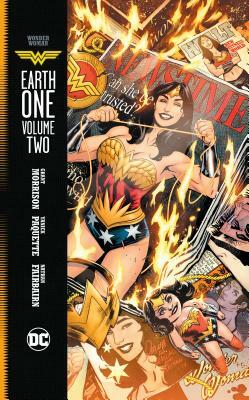 The highly anticipated sequel to the #1 New York Times best-selling original graphic novel is here in Wonder Woman: Earth One Vol. 2, from the acclaimed creative team of Grant Morrison and Yanick Paquette! For years Diana of Paradise Island yearned to leave behind the only home she knew for adventures that lay beyond its shores. Now, after a fateful meeting with Air Force pilot Steve Trevor, the Amazon Warrior finds herself in Man's World. And she is ready for anything that it may throw at her. Continuing the tradition of critically acclaimed Earth One tales that challenge the status quo of the comics industry, Wonder Woman: Earth One Vol. 2 is Grant Morrison's latest genre-rocking salvo. With illustrations from Yanick Paquette, this original graphic novel is a classic in the making. Grant Morrison has been working with DC Comics for more than twenty years, beginning with his legendary runs on the revolutionary titles ANIMAL MAN and DOOM PATROL. Since then he has written numerous best-sellers -- including JLA, BATMAN and New X-Men -- as well as the critically acclaimed creator-owned series THE INVISIBLES, SEAGUY, THE FILTH, WE3 and JOE THE BARBARIAN. Morrison has also expanded the borders of the DC Universe in the award-winning pages of SEVEN SOLDIERS, ALL-STAR SUPERMAN, FINAL CRISIS, BATMAN, INC., ACTION COMICS and THE MULTIVERSITY. Currently, he is writing the epic space adventures of Hal Jordan in THE GREEN LANTERN. He is the co-creator of the 2017 hit SYFY television series HAPPY! based on his comic book, with season two shooting this summer in New York. Concurrently he is co-creator on a TV adaptation of Aldous Huxley's BRAVE NEW WORLD, in development for SYFY/USA.